The following email was received from Hans-Martin Riehle in Germany who has researched relatives of his ancestors’ who emigrated to the United States in the second half of the nineteenth century. Herr Riehle provides a number of interesting observations that are based on his investigations. Please note however that he does indicate that his comments are without firm statistical support and certainly Riehle.Net has not attempted to further confirm the accuracy of the observations. In our experience, the clear majority of Riehles here in the US originated in the Baden-Württemberg area with fewer encountered from further east. This may however reflect our origins and the origins of many Riehle’s in the midwest, where perhaps word spread back to Baden in the mid-nineteenth century that social, climate and soil conditions were good. As stated elsewhere, we would like to hear from Riehles who’s Immigrant Ancestors landed in other parts of the US to tell their story. In any case, we appreciate Hans’ contribution and we encourage feedback concerning the observations as well as any information on the specific descendants of the emigrants for whom he is searching. Feedback can be provided via reply below. 3 – There is no known connection or relationship between those areas. 4 – People of those areas have different confessions: people of area “a” and “c” were evangelic, people of area “b” are Roman Catholics (few exceptions are possible). 5 – There had been emigrants from every three areas. 6 – Most emigrants went to America (17-19 century), but some Riehles also emigrated to East-Europe and to Switzerland. 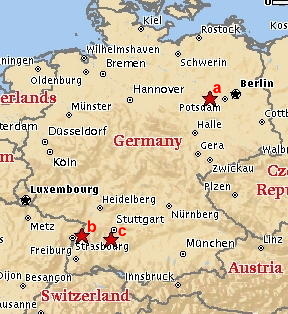 7 – Until the present day many Riehle-families live in the areas “a”, “b” and “c”. 8 – My ancestors came from Mähringen (area “c”). In this village the name Riehle was first mentioned in tax-lists of the year 1545 . Starting with the year 1652 and up to the present day birth-, marriage-, and death-records were made by the parsons- and can still be seen in the archives. 9 – Dr.Walter Schmid did great research concerning emigration from Mähringen and surroundings. He published a book about the emigration.